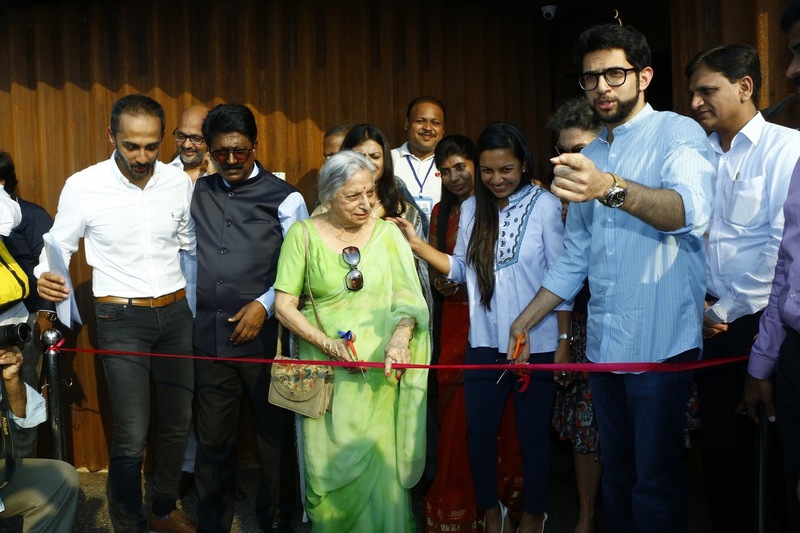 The Mumbai Municipal Corporation of Greater Mumbai (MCGM), JSW Group, Samatech and NPCCA, announced the completion of Mumbai’s first cleantech sanitation facility at Nariman point Marine Drive. This unique sanitation facility has been constructed as first-of-its-kind co-creation. The state-of-the-art world-design sanitation facility will be opened for public on October 2 and serve thousands of Mumbaikars who throng the 3.7 km-long promenade. Weathering Steel: The toilet's monolithic form is built entirely in weathering steel sheets which are supplied by JSW Steel. Weathering Steel is increasingly used around the world to construct famous monuments and structures given its sustainability and strength. 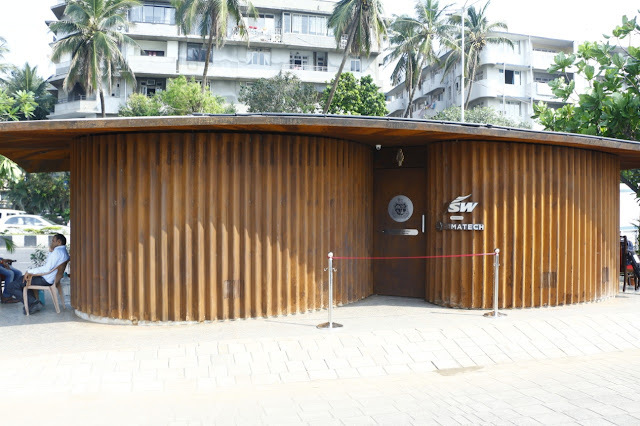 As this toilet is situated right on the sea face at Marine Drive it will be immune to the persistent bruising of the saline air and battering of waves during the cities' monsoon. In effect the material used has very low maintenance and is safe given its long lasting nature. Vacuum Technology that saves 90% of Fresh Water: The sanitation facility is based on world-class vacuum technology from Norway, supplied by Samatech. Every flush reduces the water consumption by 90% by using only 0.8 litres per flush compared to 7-8 litres used in a traditional toilet. This is a huge fresh water saving in a city where water is scarce resource. ü 90% Less Sewage: Since every flush saves 90% of water as compared to traditional toilets, it reduces the sewage generated by nearly 90%. This allows the Marine Drive Toilet to store of all sewage in an integrated tank. The integrated storage tank has a capacity to hold sewage of up to 8000 users. ü Intelligent Sewage Disposal: Given the Vacuum technology and reduction of sewage, the MCGM suction trucks will able to collect the sewage on weekly basis and dispose it at their sewage treatment plant. In effect the toilet saves millions of liters of raw sewage from entering the Marine Drive Bay area every year. ü Solar Powered: Curved solar panels, supplied by JSW Energy, are shaped to snugly fit the curvature of the doubly curved roof. These solar panels will generate enough power to make this close to a net-zero energy public project. Unique Design: The Marine Drive sanitation facility has been designed to combine art of beautiful construction with intelligent sanitation technology. A large doubly curved roof caps the elliptical volumes of the toilet and extends gently outward, creating a deep overhang to provide a shade for citizens waiting outside. The streamline Art Deco grammar of curves, plater flutings and barrel form echoes in the design. Slim, capsule shaped fenestrations ensure cross ventilation through the toilet while ensuring visual privacy for the users. Its custom design ensures the need of citizens are considered and yet goes far beyond to create a world class sanitation facility for the iconic promenade. The two primary sponsors of this sustainable toilet project are the JSW Group and Samatech. However, many stakeholders have joined hands to make this toilet project possible. The MCGM, Local Corporators, MLAs, MPs and Citizen Groups of the area encouraged this initiative and provided the opportunity to JSW and Samatech to construct this world class facility for the people of Mumbai. The NPCCA Citizens Association have been instrumental from the beginning to suggest a world class sanitation facility for this famous boulevard. JSW and Samatech have worked together with Serie Architects to conceptualize a design that would exemplify the values of sustainable environment design and technology. Many other Companies & Consultants have contributed their time, their expertise and their materials free of cost to the project to make it a reality and create this facility for the betterment of the city. Speaking about this project, Ms. Tarini Jindal-Handa of JSW Group said, “Marine Drive is a place that’s close to every Mumbaikar’s heart. The toilet is a small but significant addition to the face of the promenade. The toilet has been designed using Weathering Steel, specially cured by JSW for this project, which ensures durability and sustainability of the structure, against the vagaries of nature. The vacuum technology used ensures judicious use of water and city resources. Further, the Solar panels on the roof, ensure that Toilet is self-sustainable in terms of its energy consumption. We hope that this project shows the way in terms of how various stakeholders can co-create a public utility designed to improve the lives of individuals in the city ,in a smart ,aesthetic and sustainable manner. The JSW Group is proud to dedicate this facility to the city of Mumbai. The nearly 100-year-old Mumbai’s iconic boulevard Marine Drive also popularly called ‘The Queen’s Necklace’, is one of the most famous places visited by tourist and locals alike, to stride along the walkway, jog, practice yoga and to view the stunning sight of the setting sun at dusk. In the fast-paced life of Mumbai, Marine Drive instils a sense of calm and serenity while being a favourite hangout for citizens from all walks of life. The launch of this sanitation facility will bring respite to millions of people visiting this iconic promenade. JSW Group: The US$ 13 billion JSW Group played a key role in India's growth story. Ranked among India's top business houses, JSW's innovative and sustainable forays into the core sectors of Steel, Energy, Cement & Infrastructure are helping build a new nation. The Group continues to strive for excellence with its strengths, differentiated product mix, state-of-the-art technology, excellence in execution and focus on sustainability. With a diverse workforce of over 40,000 people, JSW continues to strive for excellence with its strengths, which comprises its differentiated product mix, state-of-the-art technology, excellence in execution and focus on sustainability. Samatech: The Samatech Foundation is a social development foundation with a vision to introduce sustainable and clean sanitation technologies to the Indian Subcontinent. The Foundation’s mission is to employ sanitation technologies that are smart, cost effective, clean and environmentally friendly in nature. The foundation holds that sanitation is not a luxury for the affluent community, but rather a necessity for all Indian people. The Samatech foundation works with the local Municipalities and Corporations to identify, facilitate and fund sanitation projects for the local communities and endeavors to take active participatory role in execution of these projects. NPCCA: Nariman Point Churchgate Citizens’ Association (NPCCA) was set up in 1981 and Nariman Point Churchgate Citizens Welfare Trust (NPCCWT) was set up in 1989. NPCCA functions as a voluntary public interest organisation free of commercial and political interests. It works on issues for improving the neighbourhood and quality of life of its residents. Late Mr. Nani Palkhiwala, eminent jurist, was a Patron of NPCCA and had guided and advised NPCCA on its activities.